I feel quite lazy to remember a lot Linux build commands while building Linux kernel image and also don't want to repeat to typing the build commands every time need to modify and rebuild the kernel image. So, I looked at a tool help to make build processes to be more user friendly. Eclipse IDE and its plug-ins are the great fit tools for this purpose. 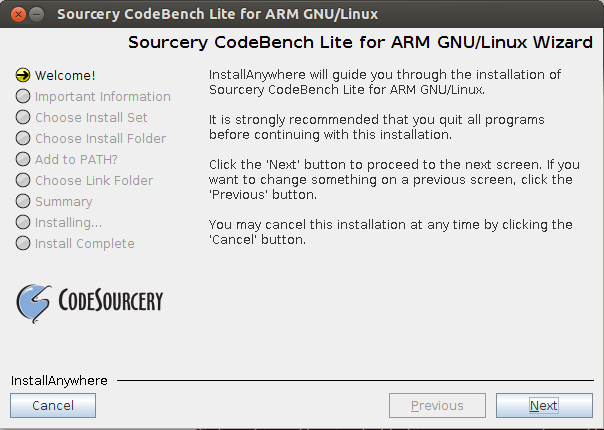 In this article, I intend to setup needed environment for building the Linux kernel image for Atmel AT91SAM9260 SoC which is based on ARM926EJ-S core. The target board is Olimex SAM9-L9260. Host OS is Ubuntu 13.10 64-bit. There are some differences in setting up environment between Ubuntu 13.10 and previous versions. A great thing here is all tools used in this project is free ^-^. a. Run command: sudo apt-get update to update software list to local repository. b. Run command: sudo apt-get dist-upgrade to upgrade to latest version of all programs in the system. c. Run command sudo apt-get install ia32-libs to support for 32-bit applications which need 32-bit libraries to work. CodeSourcery GCC will need these libraries (ia32-libs packages are no longer support from Ubuntu 13.10 onward, see the note at end of this page for workaround). d. Run command sudo apt-get install libncurses5-dev. This library is to support for make menuconfig running on 64-bit host PC. e. Run command sudo apt-get install u-boot-tools. This is a utility to package vmlinux image to uImage format which is able to be booted by U-boot. a. Download Eclipse Java EE 64-bit (http://eclipse.org) and unzip it to home directory. You can download Eclipse IDE for C/C++ Developers instead. I’m using Eclipse Kepler 4.3.
d. Install Eclipse C/C++ plug-in (if you haven’t installed it yet). - Paste content below to the file and save it. - Make the file executable and copy it to desktop directory. (Note: A bug was found in Eclipse Kepler 64-bit when running on Ubuntu, follow step e above to fix the problem). - Installs git tool (this is optional step) by command: sudo apt-get install git. 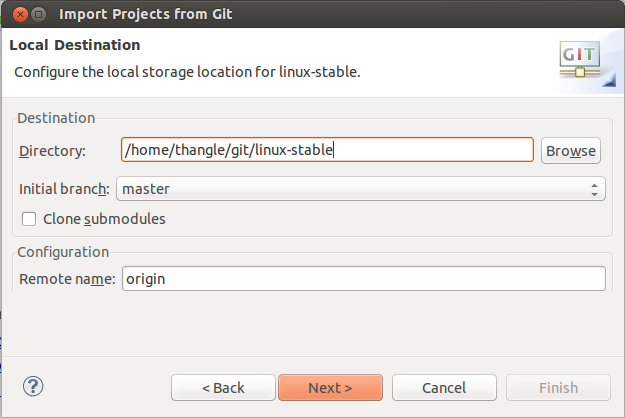 - However, in Eclipse EE, Egit an Eclipse plug-in for git already built-in. We will use Egit for management our source code. Downloads CodeSourcery GCC Lite (http://www.mentor.com) and executes it. 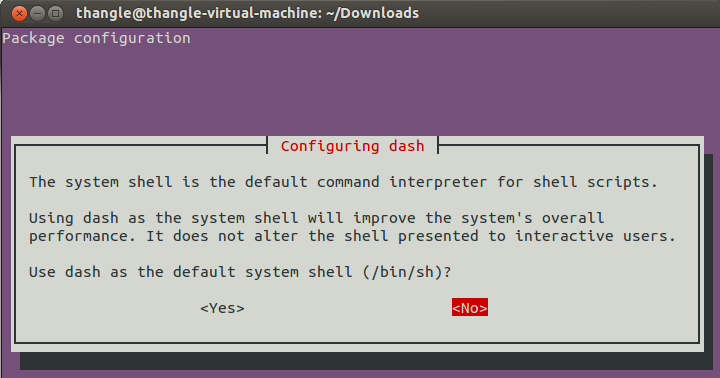 Before you run installer, change system shell from dash shell to bash shell by run command: sudo dpkg-reconfigure -plow dash. Selects No in pop-up window appearing. This step is only applied for Ubuntu OS. Follow guidance in installer to start installation. If it doesn’t show result as above, then you need set PATH again. Run command: sudo gedit /etc/environment and append the path of CodeSourcery directory to current PATH variable. Check in user guide for more details. 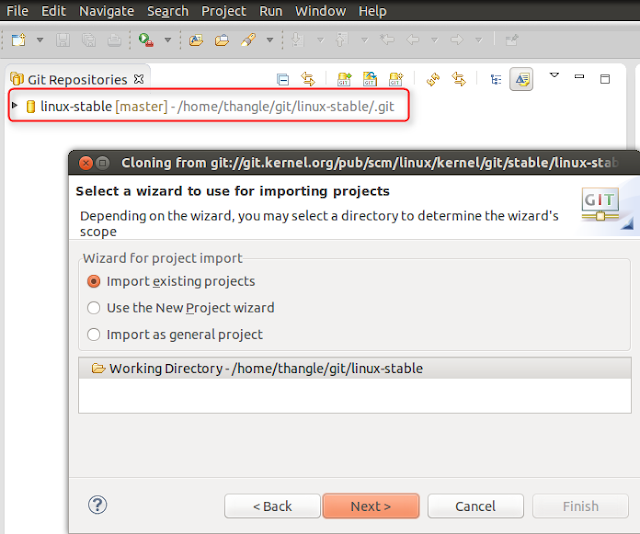 There are two ways to get the kernel source code: by git tool via terminal and by Egit plug-in from Eclipse. 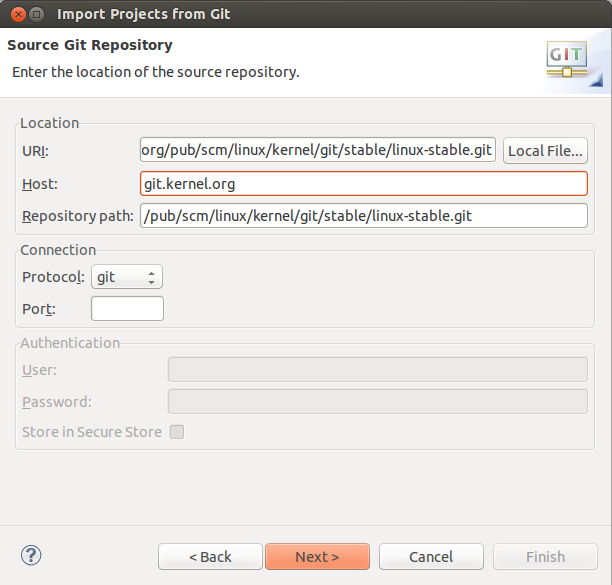 - To get kernel source code by git tool, firstly needs to install the git tool if it hasn’t installed by executing the command: sudo apt-get install git. 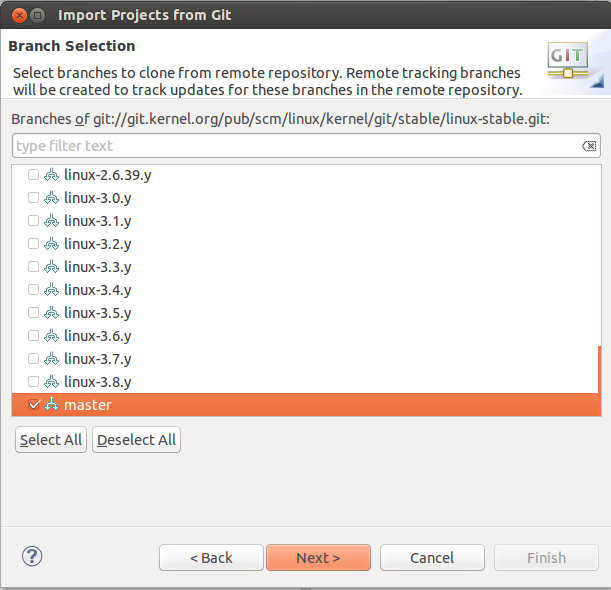 After that, in order to download kernel source code, runs the command: git clone git://git.kernel.org/pub/scm/linux/kernel/git/stable/linux-stable.git. 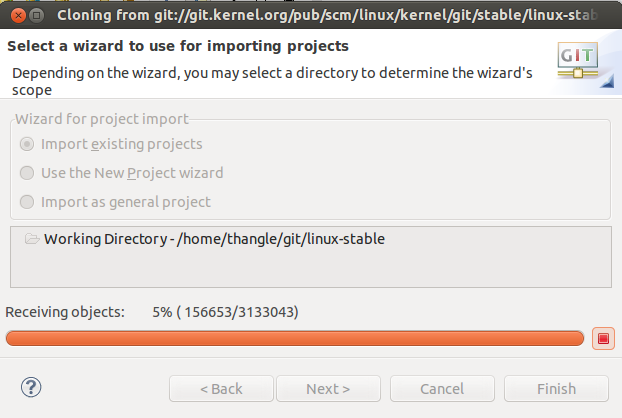 After completed download, the kernel source code will be stored in folder linux-stable of current directory. In this example, it is /home/thangle/linux-stable. However, we will not use this method to get the source code but Egit will be used instead. 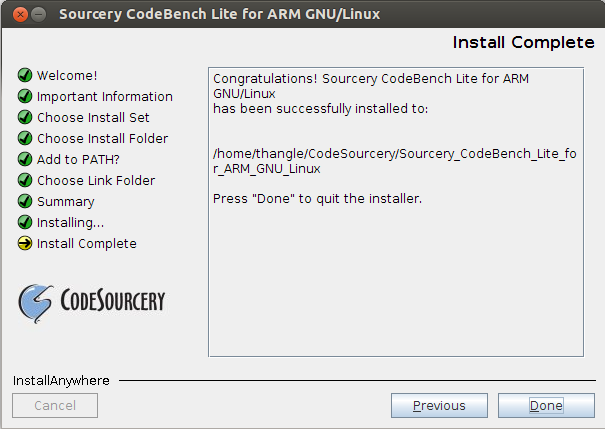 - Get kernel source code by Egit, an Eclipse plug-in. Select branch “master” which is latest stable base-line. And completed downloading source code to your local directory (/home/thangle/git/linux-stable). Click Cancel button to completed check-out kernel source code. We will import kernel source code to Eclipse later. 5. menuconfig: the program will process Kconfig file and generate .config file. The make program will build and auto start menuconfig program when we enter command: make menuconfig. Note: menuconfig program is distinct from make program. In kernel source code, menuconfig is on directory linux-stable/scripts/kconfig. 6. Patch file: is used for software version control. This topic is realy nice. i am working with 32 bit system, how prerequisite will change for 32 bit system? Just same as 64bit version. Compiler works with both 32 & 64 bit host machine (Ubuntu, Fedora).